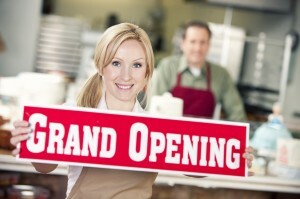 Do your 2013 goals include opening a new restaurant? If you’ve always wanted to create your own food service brand but were never sure where to even start, this checklist will help you take action to launch and grow your new business. Creating a brand will serve as a foundation for all other decisions you’ll make as you open your new restaurant. It will define who your target audience is, what types of cuisine you’ll offer, if you’ll serve alcohol or not, and what equipment you’ll need. You will want to do some market research to see how many competitors in that niche you’ll have in your community and if your neighborhood will be a good fit for your concept. Reapply the concept in a new way for your target customers, so you’re offering them something different that they can’t get anywhere else. This first step will lead you to the right size space (seating for 20 or 350? full kitchen? bar area?) and help direct every single subsequent step you’ll take, so make sure you put a lot of effort into establishing your concept and brand. It’s the basis of your entire vision. After you decide on your concept (fast-casual, fine dining, sports theme, family friendly, bar-focused, etc), then you can create your restaurant’s name. Be sure to survey some people or ask your potential customers to help you choose on the best name. A bad name can turn diners away before you even get the chance to win them over. Picking the right name is crucial. It may sound easy, but it’s often not. You want a name to be clever, tell what type of restaurant you are, and be easy to remember. If you are going to experiment with a different spelling, make it really obvious. Or you’ll be forever talked or written about incorrectly. A good name is a key element to success. Once you’ve developed your concept and given yourself an awesome name, your entire brand will start to come together. Your look, your message, your values – the perception you want others to have when they see your name or logo is very important. How do you want them to feel about you? What do you want them to think of immediately? 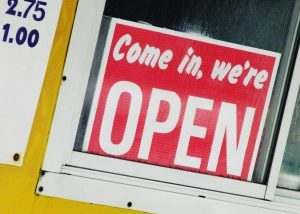 You have to decide what exactly your restaurant stands for, then stay consistent with how you communicate that message to your constituents and community. A graphic designer can help crank out a logo and color scheme that meets your brand’s expectations. Start using it immediately, even through the planning stages, to start creating brand recall in the minds of those you’re marketing to. Write some key messages that you can also repeat on all collateral you produce for distribution. Incorporate those colors, messages, and overall branding into the rest of what you do. Knowing who you are as a business helps others know and remember who you are, too. And people knowing who you are is important for the bottom line. Sometimes it is months to years from concept to grand opening, so be patient and plan accordingly. Executive Summary – State your objectives. Summarize your business plan into an introduction statement. State your restaurant’s mission and vision statements. Include what makes your restaurant different. Company Summary – Include founder biography(ies), your proposed restaurant name and logo, and take the entire concept you defined in step one and put it into writing. Market Analysis Summary – Include charts and statistics from the initial market research you performed. Include resident demographics in the geographical area you’d like to open your new place. From the totals, show which market share you assume your business will be able to target and gain. If there are opportunities you can identify to collaborate with a competitor or another small business to capture more market share, list it here. Strategy for Implementation – State where you will look for property to lease/purchase. Share how you will recruit and train staff, and give details about your management strategy. Discuss your ideas for integrating technology and promotions. Provide a 5-year outlook and any additional expansion goals you may have. Financial Plan – Show the numbers. How much do you need for upfront costs? What are your expected monthly expenses? When do you think you can begin repaying loans? How much do you expect to gross in the first year, in the first 3 years? What is your pay-off schedule? What is your expected revenue? 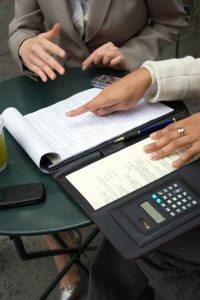 An accountant or marketing forecaster can help you with writing a solid financial plan for your business. This section will be the most interesting to your potential lenders, and therefore, it may be the most critical if you’re not the one fronting all the costs to start up. Appendix – Provide any referenced materials, additional research, sales forecast charts, etc. in the back of the report. Identify potential investors and consider all your options for small business loans, if needed. Take your plan, and let your brilliant concept do the talking. Negotiate, beg, hope for a good outcome, and be sure to stick to your promises and pay-off schedule. What will you use as a point-of-sale (POS) system? Do you need an advanced computer and cash register system, or can you incorporate a square card reader on your phone? What online directories can you be added to? What restaurant directories? Are you setting up a website, or just using Facebook? Who will manage your online presence? How will people find you on their mobile devices? Do you need to be added to dining apps? How will you recruit staff? Track hours and pay staff? Will you integrate social media into your restaurant design? Should you offer online ordering? Online reservations? Is there an app you should develop for your restaurant? Most likely, you already have an idea of what types of food you’ll be serving up in your new restaurant. Now, it’s time to make it official. If you’re not serving as the Executive Chef yourself, you need to recruit one, who can then in turn recruit other talented kitchen staff. It’s the chef and their staff who need to develop a menu that can be replicated meal order after meal order consistently and deliciously. The menu should fit the brand and concept perfectly. If there’s something on the menu “just because” someone likes it, but it doesn’t fit the overall theme, then nix it. Keep the menu relatively small at first and really get down a few specialties before expanding your menu offerings. 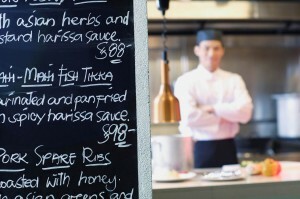 Experiment with item names and descriptions, so your brand reads well throughout the entire printed menu. When creating your menu, consider your suppliers. Will you be able to get fresh ingredients from your local farmers or fish markets? What do you need to order from your food service company(ies)? Also consider cost. Make sure your expenses are kept low and price out your menu items accordingly, so you have a reasonable profit margin on each of your menu items. Don’t stop at main courses. Think about which appetizers, beverages, and desserts tie well into the overall restaurant concept. If you’re a family friendly joint, don’t forget a separate kids’ menu. Beyond what you’ll be serving, do you know how you’ll be serving it? Do you want basket foods, or will you be using fine China dining ware? Maybe you’re offering family style meals? Or want to serve it up on something unique? Perhaps everything comes in a bowl, or your sandwiches come ready-to-assemble, or you’re going Asian and need to have a supply of chopsticks? Presentation will be an important consideration as you create your tasty menu. You’ll be developing your menu during the whole planning process, but your final menu changes should be in place a month before the grand opening, to allow time for you to secure the right suppliers and get your menu in print for opening day. Congratulations! You have the funds and menu in mind. Now you need to lease or purchase your property – whether that’s an urban bar, a family restaurant, a mobile food truck, or a street cart. If you will have restaurant seating for your guests, space planning can be very helpful in determining how many people you’ll be able to seat and which size tables and types of chairs you’ll use. You’ll also want to consider the entire layout and flow of the space you have. Whether you’re launching a coffeehouse or opening up a saloon, your space needs to reflect your brand. We recommend being in a space and getting your equipment and furniture ordered approximately six weeks in advance of opening. Depending on what the space requires, the lead time for furniture delivery, or the licenses/permits you’re applying for, your time frame may need to fluctuate accordingly. 7. Hire and train staff. Determine how many staff you’ll need, and what their individual functions will be, in order to run a smooth, effective business. Then, recruit trust worthy, dedicated employees and turn them into a team. The first thing you need to train them on is your overall brand and your key messaging, so they can also be brand advocates with each of your customers. If you need to recruit professionals to train your staff, do it. Your staff will be the link between your business and its customers, so they need to be the best you can afford. It’s opening night. You’re busy. You have a lot to do. Make sure that includes talking to your customers. Encourage your staff to ask your customers questions. Provide multiple ways for customer feedback. Then, listen. Get to know your customers on a personal level, and be sure to say thank you – a lot and in many different ways. 10. Have fun, learn, adapt. You’ve made it! Your doors are open. Your kitchen is cookin’. Your guests are happy. Enjoy it! Have fun, and keep having fun. If things get mundane, shake them up a bit to make them fun again. Keep talking to your customers and incorporate the feedback you receive. Pay attention to what people are ordering, and not ordering. Take note of wait times and cook times. Keep your books tidy, so you are aware of increasing expenses or fluctuating sales numbers. Then don’t be afraid to adapt in order to be more successful. Change menu items, experiment with different hours, switch suppliers. Change is good. Change should be constant. So have fun, and keep growing!